Hey everyone! Wow what a month in Zambia we had! I wanted to write a blog post of my own since the interns took control of the blog for June which was a major help to me. So this blog post is all about our interns. ha ha ha I bet they are scared right now reading this! I was hesitant to start the Arise Africa intern program because of concern of taking care of college kids for a long period of time in Zambia. Boy I am so glad I took the challenge and had the interns with us this month. It was amazing! They were awesome! From leaving DFW airport with them over a month ago to now it has been such a blessing in my life and Arise Africa's. We couldn't have had a better group of girls to do life with over there. Although they didn't know one another beforehand (or very little) they all instantly bonded and were willing to work together for anything. They fought through not feeling great at times, anxiety, pressure, fear, confusion, and many other things to work to selflessly and hard for those around them. 1. Malaria medicine can cause anxiety, take someone off of it if this or any other weird things are happening to them! 3. Leggings and super big extra large t-shirts are the total fashion statement right now. In fact that is all you need in your wardrobe. 4. If interns live on Nutella and coke and goldfish for the entire month, they will be fine! 5. Don't forget to remind them when going to Vic Falls and on the game drive that large African men wanting to take them on a walk to see rhinos with AR 15 rifles is actually normal and nothing to be concerned about. 11. Having 5 American college girls in your car in Africa draws attention and you get to be known around town as "The Landcruiser with the Texas A&M bumper sticker and hot girls." 13. They can't cook at the beginning of the month, but they will learn and take care of themselves! 14. They are willing to help in any way, including manual labor, holding babies that pee on you, coralling kids at Bible camp, cooking and many other things. 15. Hand them over to your Zambian staff at 6AM and say good luck and don't worry about them until night. They will manage the mini busses, compounds, and everything else just fine! 16. When you ask them if they have talked ot their parents back home and they say no but the parents are fine with that, the parents are actually not fine with that and I should expect an email! 18. 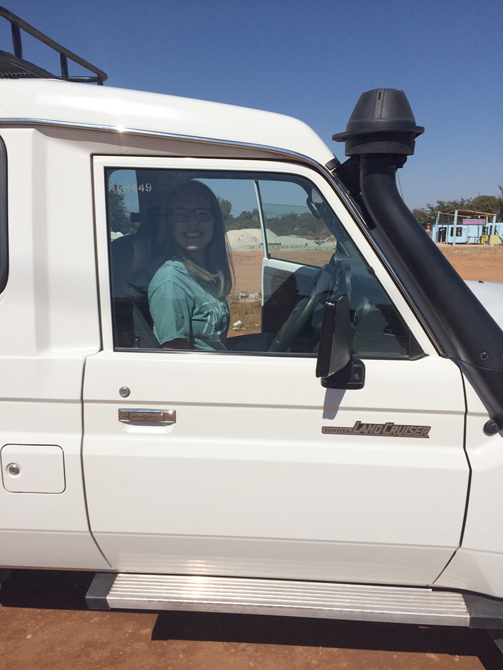 They are pretty good drivers, even in Zambia! 19. You can beat them in a NERTZ card game any day so make sure you make them do ridiculous things for losing. 20. They have hearts of gold and are great Godly girls!! I am so thankful for their help with our staff and Bible camps and everything else. We were able to accomplish so much this month and the interns were the reason why! I had so much fun seeing the girls work in new environments and trust the Lord on a daily basis. I loved watching the Lord's work be done through them. They were calm and patient when needed and were willing to work so hard. To our 2014 summer interns, you guys did GREAT! You have no idea how much God used you this past month and how thankful we are. God has a great plan for each of your lives and has uniquely made you, just hold on and keep going after Him! We love you and Arise Africa is always here for you! Don't be a stranger! Oh yea and I've paid for Millie/Annie the dog to be shipped to America, who wants her? !